How Do Acid and Base Loving Plants Get Enough PO4? 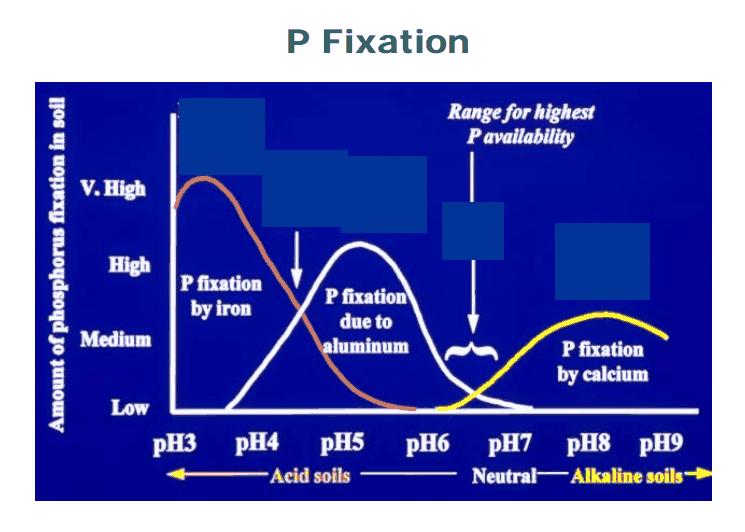 Acidic and Basic soils experience phosphate sequestration through binding with either calcium, aluminum, or iron. How do plant that thrive in acidic and basic soils obtain the necessary phosphate? Blueberries are an example that I particularly enjoy. Thanks to the University of Hawaii for posting this picture. Fixation of phosphorous occurs when the chemical equations tip in favour of less soluble compounds. Plants are able to absorb Orthophosphate ions, such as H2PO4- and HPO42-. This does tend to make it more difficult for plants to obtain their phosphorous when it is stuck to something that they cannot absorb, but it is not hopeless. These equations are equilibria, so they can be made to go both directions by adding or removing reagents from each side. The plants will pull from the left side of the equations by removing the orthophosphate ions. More will be released to maintain the equilibrium. In acidic or basic environments, rainwater will serve as a base or acid to push the equations from the right. Decaying organic matter releases orthophosphates that the plant can absorb. In this way, plants living in acidic or basic environments would still obtain enough phosphorous. Not the answer you're looking for? Browse other questions tagged soil ph phosphate biochemistry or ask your own question. Effect of pH on life? Use buffer or HCl? How about lactic acid? Can plants directly use sulfuric acid? Can RNases/DNases survive in strong acid/base solutions of around 10M? How do animals with fur get enough sunlight to produce vitamin-D? Does all the citrus fruit contain Citric acid and Ascorbic acid? How do I know which molecular structure is glycine's “base state”? How does hypochlorous acid inactivate viruses?